14 international creators—all renowned and all unique—present 13 short stories in this love letter to the endless possibilities of sequential art in all its forms. 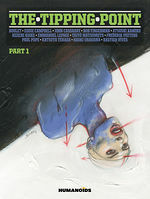 Some of the world’s greatest creators have each written and drawn an original story that explores the key moment when a clear-cut split occurs, a mutation, a personal revolt or a large-scale revolution that tips us from one world into another, from one life to an entirely new one: The Tipping Point. From slice-of-life tales and science-fiction adventures, to amusing asides and fantastical fables, witness these major (and minor) changes and evolution through the eyes of these visionaries from the worlds of manga, bande dessinée, and comics. "The Tipping Point" is a true gem, a shining star in a multiverse rich with creativity, diversity, and innovative storytelling. It will unlock new worlds, each of which you’ll want to explore time and time again. 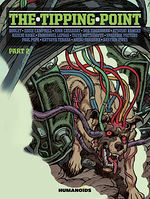 Anyone who truly cares about comic books and their creators should be sure to have this one on their shelf. Suspending the narrative to explore these precise moments is a brilliant study of humanity. The Tipping Point is, without a doubt, required reading. "The Tipping Point" is a wonderful and eclectic anthology that any and all serious comic book fans should buy... This is a beautiful book with tons of different styles and poignant stories. ...make no mistake there isn’t a story in this collection containing a single bad panel...Don’t be surprised if this title shows up on best-of lists at the end of the year. It is a curiosity deserving of your gawking and one that begs to be revisited in continued volumes with an ever-changing aggregate of the world’s creators and the perspectives they bring. Assembled with a perfect ebb and flow of levity and direness in tone and extravagance and minimalism in illustrations, The Tipping Point provides a collection of refreshingly energetic and visually exceptional work. Far from just building bridges, this anthology shows Humanoid mapping the points where the alternate universes begin to resemble each other, and showing that there is some harmony and grace within the multiverse of cartooning, and even separate universes might in fact build off each other. There is something for everyone in this anthology and probably, on balance (see what I did there...), enough to satisfy everyone. It offers the reader a certain perspective and a different experience than what you normally have reading comics. It’s new and fresh. People like that, so I recommend anyone give it a try. It features work from some of the mediums best and most well accomplished visual story tellers and it offer’s an engaging suite of stories for comics readers.